I am Accepted to Oxford and Cambridge Universities. What is Next? Imagine you are one of the “supposedly” smartest, most hardworking, and not less importantly luckiest people who were accepted to an elite university in either the United Kingdom or the United States of America. You received an acceptance letter to a masters program of your dream. What’s next? The next step is to find funding in case you were not awarded a rare scholarship or financial aid. Recently, my friend from Ecuador was accepted to a masters program in both Oxford and Cambridge Universities. He posted this news on Facebook and “likes” started to exponentially increase and the words of congratulations quickly filled up his wall. In one of the comments he voiced a concern that the cost of the program coupled with college fees and living expenses is $72,000 and he is looking for funding opportunities. According to the UN, the average GDP per capita in Ecuador is $4,205. Roughly calculated, it would take more than 17 years for an average Ecuadorian to earn enough money to afford Oxford education if that person will not eat and will live on the streets for 17 years. One might think that those prices are for citizens of the UK, well, according to UN data, GDP per capita in the UK is $35,422. For a superhuman in the UK who does not eat and have no other life goals other than saving for an elite education, it would take 2,5 years to save money to attend Oxbridge. For the sake of comparison, a citizen of Somalia would need 327 years to earn enough money to study at Oxford. One might disagree with my usage of GDP per capita and roughly generalized conclusions. Well, I do not necessarily draw any conclusions. I simply want to raise several questions: Why do those masters-level degrees cost so much? 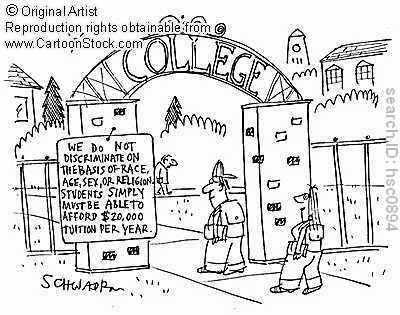 Who can afford going to those universities? What does it say about values in our society? Does education provide opportunities for a better life for all or reproduces social inequalities and class division that exist today? 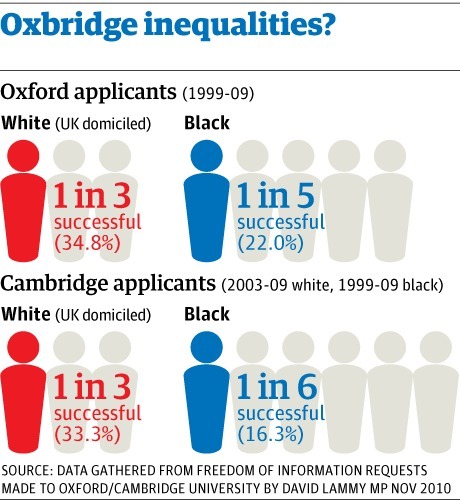 An article published in the Guardian shows a clear picture of the divide between the predominantly “white” upper and middle class applicants accepted to Oxbridge over the poor “black” (see the graph below). In fact, Oxford’s student body consists of 89% upper and middle class while in Cambridge 87.6% represent top three socio-economic groups. In “Creating a Class: College Admissions and the Education of Elites,” Mitchell L. Stevens raises important questions about the ways in which prestigious colleges in the United States increasingly accept students based on their ability to pay. Attending elite universities somehow gives you a mark of quality. You join crème de la crème of the academia or society in general. It somehow validates your opinion and makes your voice heard. While growing up, I always thought of elite universities as the places where talented and smart students study. I did not know that in many cases your purchasing power defines whether you are talented or smart. It is not hard to see how elite universities “create” or “recreate” social structures that favor elitism, which is exactly the opposite to true purposes of education.